Background/aim: We aimed to define the optimal SUVmax cut-off value in determination of mediastinal-hilar lymph node metastasis, by comparing positive PET/CT results with the results of endobronchial ultrasound guided transbronchial needle aspiration biopsy (EBUS-TBNA). Materials and methods: Thirty-one patients with malignancy whose PET/CT imaging revealed a hypermetabolic mediastinal and/or hilar lymph node and who had undergone EBUS-TBNA were evaluated retrospectively. Histopathology was regarded as the gold standard. The diagnostic role of PET/CT in mediastinal/hilar lymph node metastasis was investigated and compared with the results of contrast-enhanced CT. Results: When a SUVmax value of 2.5 was used, the sensitivity, positive predictive value (PPV), and diagnostic accuracy of the PET/CT were 100%, 65.4%, and 65.4% respectively. In the ROC analysis, the SUVmax cut-off value with the highest diagnostic accuracy (75%) was calculated as 6.3, and when this value was considered, the sensitivity, specificity, PPV, negative predictive value, and diagnostic accuracy of the PET/CT were determined as 70.6%, 83.3%, 88.9%, 60%, and 75% respectively (AUC: 0.779). The sensitivity, PPV, and diagnostic accuracy of the thorax CT were calculated as 91.1%, 72%, and 71.1%, respectively. Conclusion: When determining mediastinal-hilar lymph node metastasis via PET/CT, although a SUVmax cut-off value of 6.3 increases specificity and diagnostic accuracy, we think that a SUVmax cut-off value of 2.5 and above give more optimal results in routine practice. Detterbeck FC, Jantz MA, Wallace M, Vansteenkiste J, Silvestri GA. Invasive mediastinal staging of lung cancer. Chest 2007; 132: 202–220. Gupta NC, Graber GM, Bishop HA. Comparative efficacy of positron emission tomography with fluorodeoxyglucose in evaluation of small (<1 cm), intermediate (1 to 3 cm), and large (>3 cm) lymph node lesions. Chest 2000; 117: 773–778. Roberts PF, Follette DM, von Haag D, Park JA, Valk PE, Pounds TR, Hopkins DM. Factors associated with false-positive staging of lung cancer by positron emission tomography. Ann Thorac Surg 2000; 70: 1154–1159. Rintoul RC, Skwarski KM, Murchison JT, Wallace WA, Walker WS, Penman ID. Endobronchial and endoscopic ultrasound- guided real time fine-needle aspiration for mediastinal staging. Eur Respir J 2005; 25: 416–421. Enön S, Tokat OA, Güngör A. Küçük hücreli dışı akciğer kanserinde nodal evrelemede invaziv prosedürlerin üstünlükleri. Tüberküloz ve Toraks 2005; 53: 401–406 (article in Turkish). Reed CE, Silvestri GA. Diagnosis and staging of lung cancer. In: Shields, TW, editor. General Thoracic Surgery. 6th ed. Philadelphia, PA, USA: Lippincott Williams & Wilkins; 2005. pp. 1534–1547. Ravens-Fritscher A, Bohuslavizki KH, Brandt L, Bobrowski C, Lund C, Knofel WT, Pforte A. Mediastinal lymph node involvement in potentially resectable lung cancer. Chest 2003; 123: 442–451. Stroobants S, Verschakelen J, Vansteenkiste J. Value of FDG- PET in the management of non-small cell lung cancer. Eur J Radiol 2003; 45: 49–59. Toloza EM, Harpole L, Detterbeck F, McCrory DC. Noninvasive staging of non-small cell lung cancer: a review of the current evidence. Chest 2003; 123: 137–146. Dwamena BA, Sonnad SS, Angabaldo JO, Wahl RL. Metastases from non-small cell lung cancer: mediastinal staging in the 1990s-meta-analytic comparison of PET and CT. Radiology 1999; 213: 530–536. Gonzales-Stawinski GV, Lemaire A, Merchant F, O’Halloran E, Coleman RE, Harpole DH, D’Amico TA. A comparative analysis of positron emission tomography and mediastinoscopy in staging non-small cell lung cancer. J Thorac Cardiovasc Surg 2003; 126: 1900–1905. Pozo-Rodriguez F, Martin de Nicolas JL, Sanchez-Nistal MA, Maldonado A, Garcia de Barajas S, Calero-Garcia R, Pozo MA, Martin-Escribano P, Martin-Garcia I, Garcia-Lujan R, et al. Accuracy of helical computed tomography and (18 F) fluorodeoxyglucose positron emission tomography for identifying lymph node mediastinal metastases in potentially resectable non-small cell lung cancer. J Clin Oncol 2005; 23: 8348–8356. Navani N, Nankivell M, Woolhouse I, Harrison RN, Munawar M, Oltmanns U, Falzon M, Kocjan G, Rintoul RC. Endobronchial ultrasound-guided transbronchial needle aspiration for the diagnosis of intrathoracic lymphadenopathy in patients with extrathoracic malignancy. J Thorac Oncol 2011; 6: 1505–1509. Chhajed PN, Odermatt R, Garnier CV, Chaudhari P, Leuppi JD, Stolz D, Tamm M. Endobronchial ultrasound in hilar and conventional TBNA-negative/inconclusive mediastinal lymphadenopathy. J Can Res Ther 2011; 7: 148–151. Silvestri GA. The non-invasive staging of non-small cell lung cancer. Chest 2003; 123: 147–156. Bellek E, Erturan SS, Hallaç M, Sönmezoğlu K, Kaynak K, Bozkurt K, Akman C, Öz B, Yaman M. Küçük hücreli dışı akciğer kanserinde mediasten lenf nodu evrelemesinde PET- BT’nin yeri. Solunum 2010; 12: 13–20 (article in Turkish). Vincent BD, El-Bayoumi E, Hoffman B, Doelken P, DeRosimo J, Reed C, Silvestri GA. Real-time endobronchial ultrasound- guided transbronchial lymph node aspiration. Ann Thorac Surg 2008; 85: 224–230. De Leyn P, Lardinois D, Van Schil PE, Rami-Porta R, Passlick B, Zielinski M, Waller DA, Lerut T, Weder W. ESTS guidelines for preoperative lymph node staging for non-small cell lung cancer. Eur J Cardiothorac Surg 2007; 32: 1–8. Gu P, Zhao YZ, Jiang LY, Xin Y, Han BH. Endobronchial ultrasound-guided transbronchial needle aspiration for staging of lung cancer: a systematic review and meta-analysis. Eur J Cancer 2009; 45: 1389–1396. Nosotti M, Tosi D, Palleschi A, Ferrero S, Rosso L. Transbronchial needle aspiration under direct endobronchial ultrasound guidance of PET-positive isolated mediastinal adenopathy in patients with previous malignancy. Surg Endosc 2009; 23: 1356–1359. Hsu LH, Ko JS, You DL, Liu CC, Chu NM. Transbronchial needle aspiration accurately diagnoses subcentimetre mediastinal and hilar lymph nodes detected by integrated positron emission tomography and computed tomography. Respirology 2007; 12: 848–855. Cömert ŞS, Çağlayan B, Fidan A, Salepçi B, Doğan C, Demirhan R, Ece D. A comparison of endobronchial ultrasound-guided transbronchial needle aspiration and integrated positron emission tomography–computed tomography in the diagnosis of malignant mediastinal/hilar lymph nodes. Turk J Thorac Cardiovasc Surg 2012; 20: 843–849. Yasufuku K, Nakajima T, Motoori K, Sekine Y, Shibuya K, Hiroshima K, Fujisawa T. Comparison of endobronchial ultrasound, positron emission tomography, and CT for lymph node staging of lung cancer. Chest 2006; 130: 710–718. Kumar A, Dutta R, Kanan U, Kumar R, Khilnani GC, Gupta SD. Evaluation of mediastinal lymph nodes using 18 F-FDG PET-CT scan and its histopathologic correlation. Ann Thorac Med 2011; 6: 11–16. ISNAD KANDEMİR, ZUHAL , ŞENTÜRK, AYŞEGÜL , ÖZDEMİR, ELİF , YILDIRIM, NİLÜFER , HASANOĞLU, HATİCE CANAN , KESKİN, MUTLAY , TÜRKÖLMEZ, ŞEYDA . "The evaluation of hypermetabolic mediastinal?hilar lymph nodes determined byPET/CT in pulmonary and extrapulmonary malignancies: correlation with EBUS-TBNA". 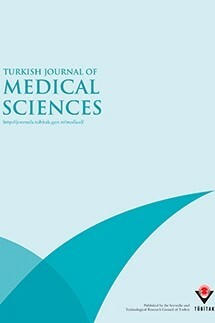 Turkish Journal of Medical Sciences 45 / 6 (December 2015): 1234-1242.